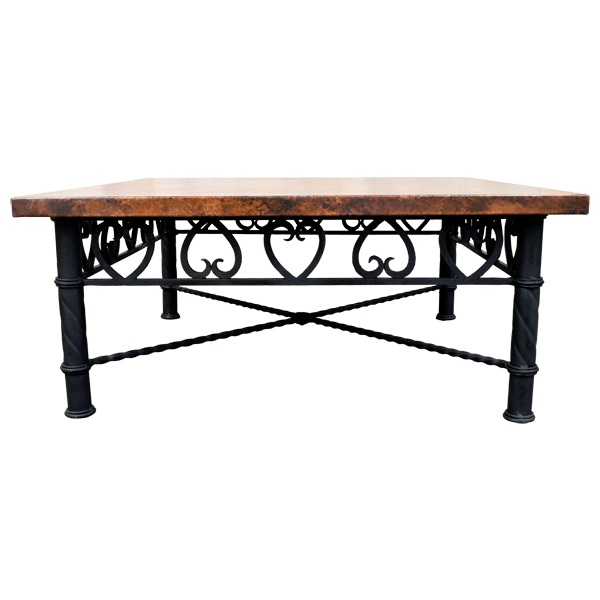 The patina on this handcrafted, Western style coffee table will become more beautiful with each passing year. The coffee table has an open, square top, and the top Is covered with gorgeous, hand hammered copper. The area directly below the table top is adorned with alternating, hand forged, iron, geometric designs. The top of the coffee table rest on four hand forged, iron legs, and the legs end in rounded, hand forged, iron feet. The legs are joined by a hand forged ¨X¨ stretcher, with spiral details. The coffee table is 100% customizable.